We’d planned all week to do a big hike last Friday. We ate a quick breakfast, packed up water and snacks, found everyone’s socks and shoes, hopped in the car, and headed down the street. But quite suddenly the innocent-looking white sky turned dark gray and it started raining. Hard. Really hard. And there was lots of thunder and lightening. We hadn’t gone far when the rain started up so we just looped around and ended up back in our driveway. It was raining so hard that we figured we’d listen to an audio book for a while (we’ve been really into audio books this summer) rather than getting soaked trying to dash into the house to wait out the storm (yes, it was really raining hard enough that we’d have been drenched to the skin if we’d tried to run the 10 yards from the car to the house). Our thwarted plans were made into a pleasant experience – listening to the rain beat on the roof in our cozy car while listening to a good story. Not half-bad. When the rain let up after a half hour or so, the blue sky peeked through and a quick check of the weather on my phone said the rain should be done so we headed out of the driveway again, parked at the trailhead and headed up the mountain. 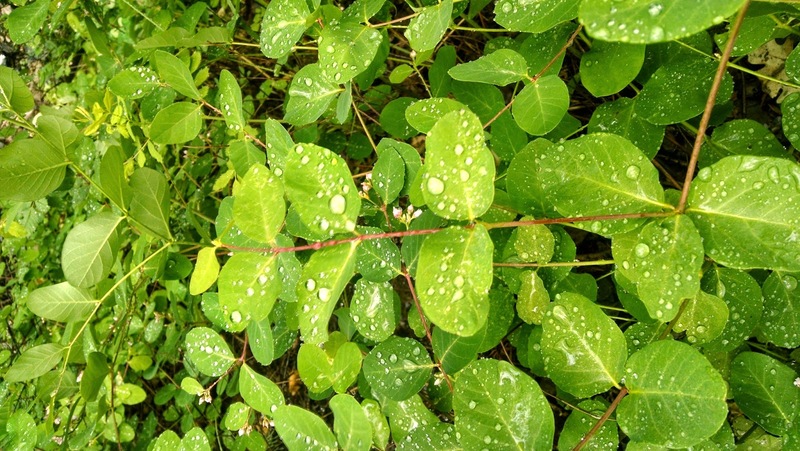 It was gorgeous – perfectly cool hiking weather, lovely droplets on bright green rain-soaked leaves, wildflowers, cloud-capped peaks, the deepened colors and clear air of after-rain. Everyone was noticing the beauty together and we were having a great time. Isaac (my 13-year-old) and my 9-year-old twins wanted to go ahead a little (they’re fast). That was fine. They know the trail well. Eliza (11), Ashton (14) and I hiked together at a slightly slower pace. 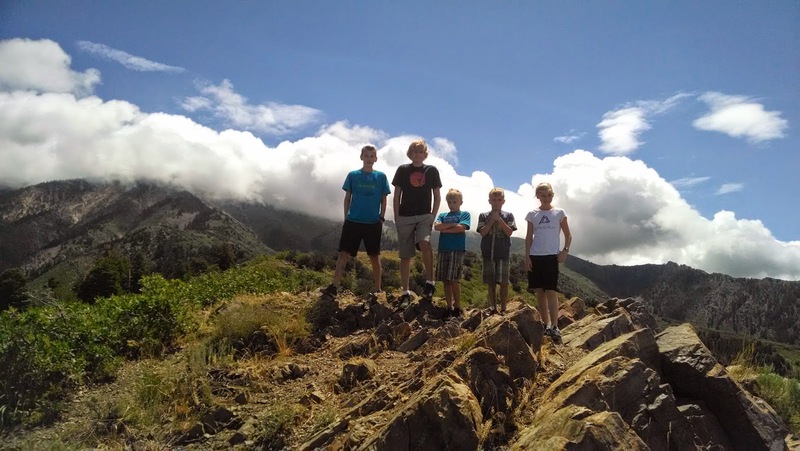 As the gap between our two groups widened, I worried about the younger boys getting too far ahead of us, especially since I tried calling Isaac and found that he wasn’t answering his phone – he must have left it in the car or at home. Darn. I really really don’t like it when I don’t know where my kids are and they might be in danger and I can’t see or reach them. I tried to hurry my little group along so we could catch up with the others. But the hurrying wasn’t sitting well with certain people. I ended up by myself in the middle of two groups and sort of frustrated and worried. I had had high hopes involving enjoying the beauty together and having some good talks while hiking. But there I was, yelling to the group in front (and not getting an answer and getting increasingly concerned) and feeling increasingly frustrated with those lagging behind (despite repeated explanations and pleas from me regarding the need to catch up with the advance group). I wasn’t having fun. And the laggers who were with me weren’t having fun. It turned out the advance group was having lots of fun – but on the wrong path. They thought they saw a “short cut” and wandered far enough off track that they were lost. Thanks to a switch-back, they finally ended up in shouting distance from me and were able to make their way back to me, full of apologies about leaving the path (they KNOW the rules . . .). 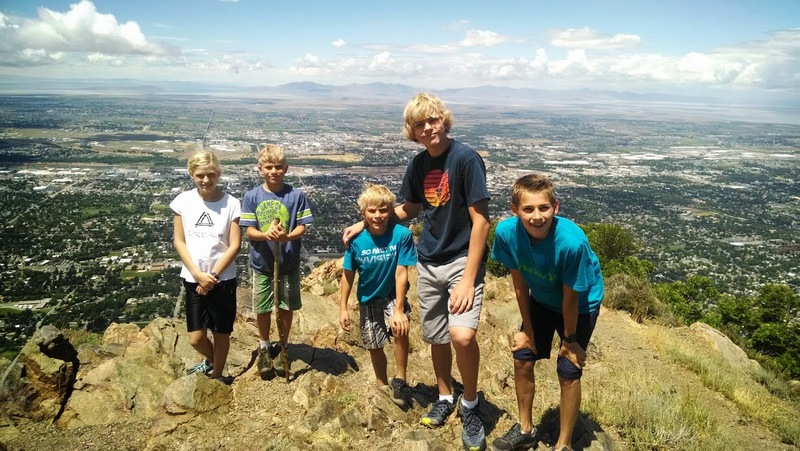 In the end, the laggers made it to the top quite a bit ahead of me and the younger boys (somehow those laggers I’d been with had gotten ahead of me while I was finding the younger boys – so then I was worried about where the laggers were – and of course, Ashton’s phone was dead . . . ). So when we all made it to the top, I was ball of nerves and things just weren’t very happy. We sat down and had a good talk up at that summit about staying together on hikes, making sure we had our phones with us, staying on the path, that sort of thing. And then we enjoyed that top-of-the-world feeling you get after a long hard hike, took pictures, and had a really fun and lovely hike down, waiting for each other, staying together, laughing and talking. So the hike ended on a happy note. 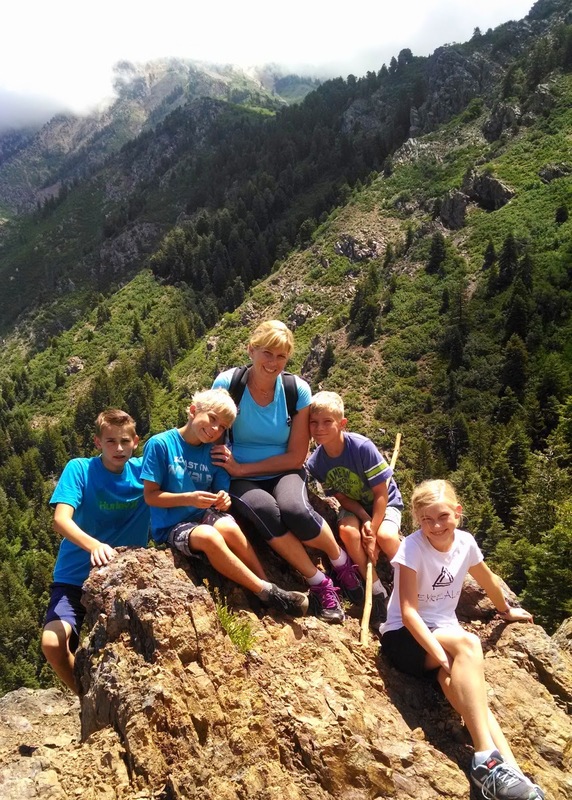 Isn’t motherhood a lot like the story of this hike of ours? We go into things with great and happy anticipation. And even when there are false starts and “weather” that gets in the way, we’re often good at keeping a positive outlook and pushing on ahead. Our plans may be solid, the scenery may be lovely, and joy may seem to be well within our reach. But then more stuff happens. The weather holds, but new challenges come up. Some of the people involved in our plan (our kids, other family members) inevitably want to take their own path. And some people (yep, it’s usually the mom . . .) are overly focused on keeping everyone moving along at a good clip. It’s hard to really see the beauty of it all while we’re trying to keep everyone safe and moving forward on the right track. Everyone wants to go their own pace and do their own thing in their own way – but we often have to stick together. So people get grumpy. And sometimes there’s yelling. But in the end, we can have good talks and realize some things we should do better next time. And we can get some pretty spectacular views even in the midst of hard times if we remember to really look around us. Plus there are plenty of beautiful moments to be enjoyed if we can tuck away our frustrations and trust a little more and worry a little less. This past fifteen years as a mom has sure taught me a lot about letting go, about getting over things, about fixing and moving on, about trial and error. We’re so imperfect. Our kids are so imperfect. But as we keep on trying and tweaking and trying again, there can be great beauty and progress alongside the inevitable challenges and frustrations that serve to make us stronger. *** This was originally posted in August, 2014. QUESTION: What are you learning about motherhood through your less-than-ideal experiences? CHALLENGE: Take the time to really look around you and see the beautiful “views” motherhood can offer. Keep a journal where you write down one thing you’re learning each day through motherhood. Forgive yourself, make adjustments, and move on in a positive way after challenges and disappointments and frustrations. Thanks Saren for sharing this. 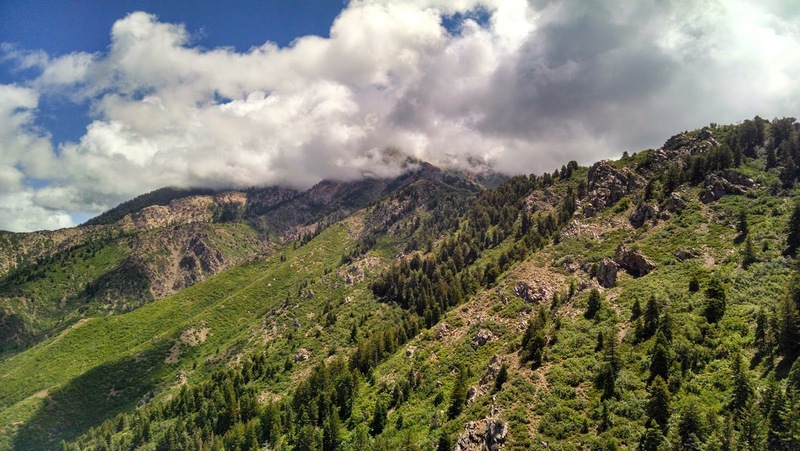 As an avid hiker, this story has a lot of meaning for me. Very well said!! As a father of five daughters, two of whom follow Power of Moms, I get and follow it also. As your kids get older this all applies even more. My oldest three are now all in college and the younger three at home. They are all on different paths, some more similar then others. But all good paths that are tailored to the one walking it. In the end the goal is to end up together. Mom is the glue that holds it all together. I loved seeing your children, Saren, they’ve grown so much since I last saw you. I’m in year 12 of motherhood and have four children. I feel like I’m drowning most days and staying positive is truly a daily aspiration. On top of that I’ve struggled with depression, that takes makes motherhood so much more difficult. I appreciate your posts of encouragement and I admire you so much. Thank you for all you do. We just got back from Crater Lake yesterday so the hiking analogy was perfect for my present situation.